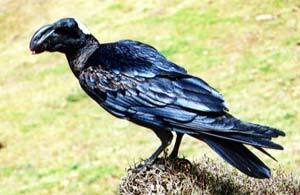 The raven always attacks the eye of an animal first; seeming to prefer that to every other part. he raven has always been very well known to man, and is mentioned almost at the beginning of the Bible. You remember that this was the first bird that Noah sent out of the ark to see whether the waters had begun to dry up; and that it did not go back to him again. I suppose it was very glad to be at liberty after it had been shut up more than a year; and as it lives upon the flesh of other animals, it probably found food enough from the bodies of those that had been drowned. It is a large bird, considerably larger than the crow; and its feathers are very black, very glossy, and very beautiful. People in ancient times seem to have liked a black color, and were especially pleased with black hair; so we read in the Song of Solomon, where one who is beautiful is described, "His locks are bushy, and black as a raven." It is said that the raven always attacks the eye of an animal first; seeming to prefer that to every other part. This may explain one of the verses in Proverbs, "The eye that mocketh at his father, and despiseth to obey his mother, the ravens of the valley shall pick it out, and the young eagles shall eat it." It has been the custom, in many countries, to hang those who have been guilty of great crimes on a tree or on a gallows in the open air; and there to leave the body for the birds to peck at and devour if they chose. I suppose this verse means that stubborn and disobedient children, or those who are not kind and respectful to their parents, must expect to come to some sad end; and they very often do so. I have heard that the raven drives out its young ones very early from the nest, almost before they are able to seek their food. This may explain a verse in the Psalms, "The Lord giveth to the beast his food, and to the young ravens which cry;" and another in Job, "Who provideth for the raven his food ? when his young ones cry unto God, wandering for lack of meat." Our Savior speaks of this bird in the 12th chapter of Luke, "Consider the ravens; for they neither sow nor reap; they have neither store-house nor barn; and God feedeth them." He was speaking to his disciples, and it was as much as to say, "If God takes care of the ravens, he will certainly take care of you; so you need not be anxious or afraid. Have you read in the Bible how a good prophet's life was once saved by ravens? The people who were living then were very wicked, and would have been glad to kill the prophet Elijah; so God told him to go into the wilderness and live there alone by the side of a small brook. Elijah went to the brook, and there was water enough for him to drink, of course, but no food to keep him from starving. You may be sure that God did not forget his servant; but you would hardly believe, if it was not in the Bible, that he would send the ravens to carry food to him. Yet so it was: "the ravens brought him bread and flesh in the morning, and bread and flesh in the evening; and he drank of the brook." It is supposed that he was fed in this way for as much as a year. It was a long time to stay there by himself; but I do not think he was lonely or afraid, for he loved God, and felt sure that He was always near him, even in the wilderness.